'MINTONS / CHINA WORKS / STOKE ON TRENT' in relief. This tile is from series pattern No. 1347 Spirit of the Flowers possibly designed by C.O.Murray for Minton c.1880. The complete set of twelve included 'waterlily, wildrose (as shown here), poppy, lily of the valley, daisy, foxglove, violet, convolvulus, anemone, snowdrop, lily and primrose'. 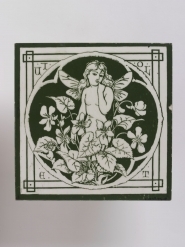 Reference - Lockett, T. Collecting Victorian Tiles, 1979, pp.81-87. 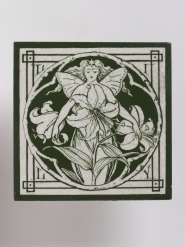 An earthenware tile transfer-printed in green on a white glaze. A winged naked girl emerges from a bouquet of wild roses. The central motif is framed with a Japanese style border that has divided lettering in the corners: 'WI', 'LD', 'RO' 'SE', (WILD ROSE) describing the flower in the design. The underside has Minton's Globe mark and'MINTONS / CHINA WORKS / STOKE ON TRENT' in relief.